Mom Fabulous readers, meet fall’s newest jewel tone…emerald. This color has been seen on fashion icons and is such a great color to incorporate into your fall wardrobe. It works on all skin tones, which is always a plus, and is a gorgeous color on everything from jewelry and handbags to outerwear and sweaters. Here are a few of my favorite pieces you can incorporate into your current wardrobe. Wear the Happily Emerald After dress from ModCloth with your favorite black heels and you will be stunning! Add in touches of gold jewelry, a black clutch and you’ll be ready for dinner out with that special someone in no time. With this rich emerald hue, there’s no need to add much of anything to your outfit. It’s classic and simple, yet stunning and statement-making; all at the same time. Perfect for fall, this lightweight Emerald blouse will look classic with a pair of black slacks, but can also be dressed down with black jeans. 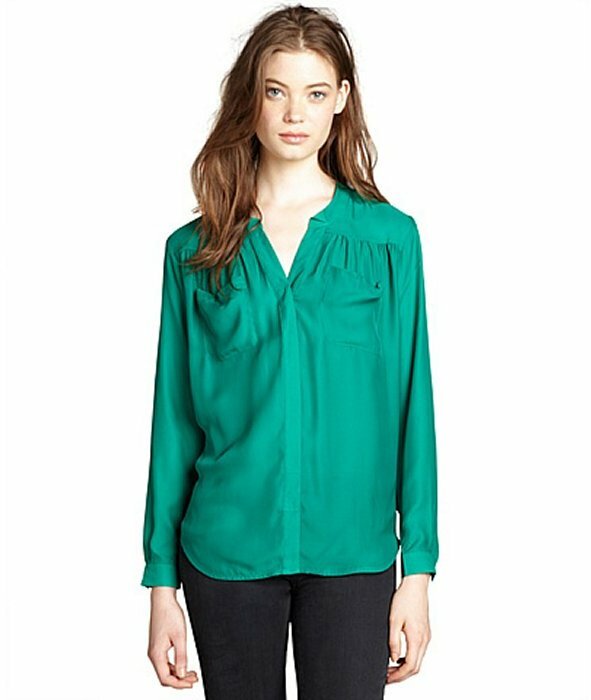 The hidden buttons and v-neck give this blouse a fun and feminine look. Emerald is the new black. Spice things up a little in your wardrobe with a pair of Emerald Jeans from asos. These add a fun pop of color to a closet staple and bring a whole new meaning to laid back office Fridays. This stunning Emerald necklace is called “Fit For a Queen Necklace” and I can see why! 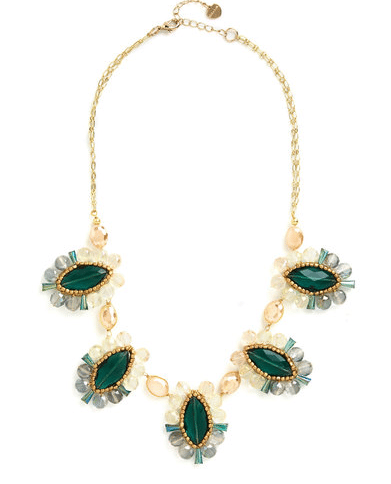 This statement necklace will bring any outfit up a notch, possibly even to royalty status. Picture this with your LBD…I know…gorgeous. Talk about a handbag that makes a statement and will turn some heads. 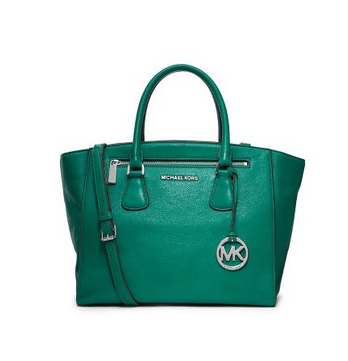 How stunning is this Michael Kors handbag in emerald? I’m in love. You can style it as a crossbody bag or tote. I couldn’t help it. 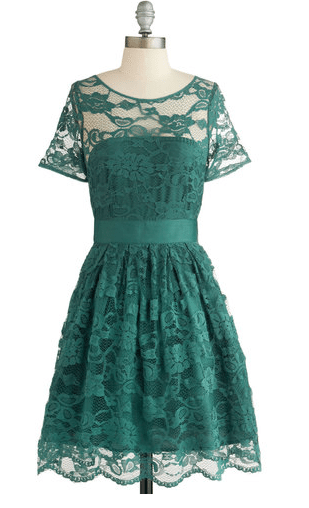 I had to include yet another emerald green dress and this one is decked out in lace! This dress is so feminine with it’s illusion neckline and floral pattern over-lay. You can find it soon at ModCloth. 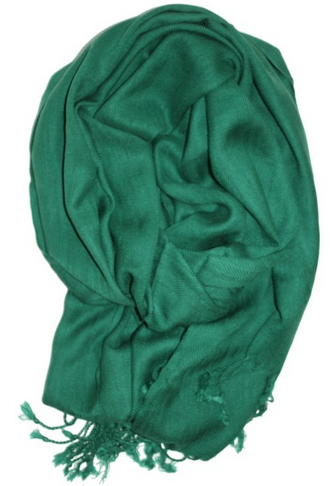 Add a touch of emerald green with this silk and Pashmina scarf. I’m thinking head to toe black with this lovely wrapped around your neck. Classy and sophisticated, yet comfortable and doable for anyone. Are you ready to incorporate touches of emerald green into your Fall Wardrobe? I am 71, but people think I am 15 years or more younger. I have to have two wardrobes, one for Cosa Rica where I live for 3 months at a time and clothes I can wear when I visit in the states. Most of the capsule wardrobes are for cutesy young girls, not for mature women. Having breast cancer makes bra less impossible. Wearing wigs because of hair lose is another problem. Those are just two of the problems that are not talked about.